This month, I'm working on an article about exchange students in Oklahoma. I loved this assignment! I got to interview students from China, Italy, Spain and Montenegro. It was so fun hearing about their adventures in the United States and learning something about their culture at the same time. They shared some of the fun things they did, what they learned here and how they interacted with their host families. You won't want to miss this one! Look for this article in Oklahoma Living Magazine in August 2012. In April, I traveled to Purcell, Oklahoma, to interview the staff and residents of Rob's Ranch for an article that will be published in June issue of Oklahoma Living Magazine. I was really impressed with this organization. They provide a long-term treatment program for men with alcohol and drug addiction. If you know someone who needs help, I highly recommend this organization. I'll post a link to the article when it's available. 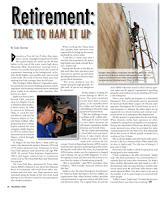 My latest article, Retirement: Time to Ham it Up, was published in the May 2012 issue of Oklahoma Living Magazine. You can read the entire issue on the company's website (May 2012 issue, page 30-31) or just my story on my website.